In this part of my Android Development Tutorial, I will build an Android user interface. I cover how to do numerous things: How to use the Android Visual Layout Editor, How to edit the GUI layout by editing the XML, How to use TextView, EditText and the SeekBar, How to catch events, How to save the apps state with onSaveInstanceState(), How to get values from components and how to change the values. The video and code below will teach you all you need to start making apps. The value isn’t stored in TOTAL_BILL, TOTAL_BILL stores the name for the key that is associated with value. These are key value pairs. I should have pointed that out better. Then when putDouble(String key, double value) is called it inserts a double value into the Bundle, and replaces the value for the given key. I hope that clears that up. Sorry about any confusion. If your app is crashing when you use the seekbar it is because I don’t except commas in the price. Make sure you enter a period before the change amount and you should have anymore crashes. Sorry about that. Here is the whole Android App Package available for download! // to be made available. 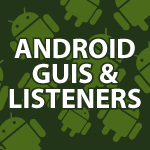 Hi, Absolutely loving the Android tuts, thanks so much – keep them coming…. I have many more in the works. I’m glad you are enjoying them. I think they will tend to be long at around 20 to 25 minutes. I’ll pack them with information. I hope to make an app in each tutorial that follows to keep it interesting. Hello. Dereck: I went through the tutorial and it show up and disappeared the first time. I erased the entire tutorial and started over. The .15 doesn’t appear when the app opens. The seek bar doesn’t work, but the calculations do work. I stepped through the program to look at the tip. The tip does work. It allows me to type in a different tip amount. But the seek bar doesn’t work. How could i fix that? Good job on the Tutorial. Have you tried running the complete package I provide. this guy is damn good, you opened up my brain. Thank you 🙂 I’m very happy that I could help out. Brilliant tutorial, nicely presented ..looking forward to your next Android tut !! I’m very happy that you begin android tutorials. I think it is the best course that you ever made from teaching prespective. You cover a wide range of things,you explain everything both theoritical and practical and you develop useful applications. You are a master,keep up this way. Hi Derek, are you familiar with PLC programming? Hi , Derek Thank you so much . Great stuff btw . I noticed that there’s a link for downloadable source code , which is great . I asked you for that lately , so thank you for taking that into consideration . You are the man ! Thank You for these wonderful tutorials. Hi Derek, I’m new to your android course (lets face it, is not a “tutorial” is a whole class!) and I’m very glad that I came upon it. I already subscribed to your channel and hoked up with your videos. thank you for taking the time and effort to share you vast knowledge. It’s not a ‘little’ website anymore Derek !! Hi Derek loving your tutorials and the way you explain things. and a actual device running 4.2.2. However if I try running it on a another device that has 4.0.3, everytime i touch the seekbar the i get the “Unfortunately. CrazyTipCalc has stopped.” message. How do I view errors, when running apps on the phone, in eclipse. Hi again Derek, sorry to be a bother. Thanks for your help and quick reply. Just thought I’d let you know what I’ve found and maybe see if you have any ideas why this happens. On the device running 4.2.2 the test textfield displays 0.15, however on the device running 4.0.3 the same textfield displays 0,15. From this it is clear the comma is causing the problem when formatting. I’ve had the same problem trying to get the app to run on my htc sensation. It turns out the problem is with the locale your device is set to. If you’re from europe (as i am) your most likely to have a “,” as a number separator instead of a “.” This causes problems with setting the text and the code errors out. This is what i did to solve this problem. Thank you very much for helping out 🙂 I greatly appreciate that!!! i am having problem running the application on emulator i keep on getting this error Unfortunately, Tipcal has stopped. what should i do about it? I tried running the .apk on my Nexus 4 and it crashes everytime i try to open the app :s.
It worked okay when i used the nexus4 emulator. If you connect and run while connected to Eclipse the LogCat will show errors. What does it show there? An error has occurred. See error log for more details. Best ever tutorial I came across with full code support. Only thin is when I tried to open “res-values-strings” Eclipse throws above error. I had the same “NullPointerException” when trying to follow this episode. The cause was related to the ContentView’s name. Since I am using API 19 as opposed to your API 17, ADT creates two XML layout files (fragment_crazy_tip_calc.xml and activity_crazy_tip_calc.xml). In your code, you are setting the ContentView to the value “R.layout.activity_crazy_tip_calc” (as this is the file that holds the RelativeLayout). However, with the new version, it should be set to “R.layout.fragment_crazy_tip_calc” (or whatever is the file that actually contains the RelativeLayout). Thank you! Looking forward to it. Incredible! I (a total noob at android) was getting the same error. This was the fix for me! Thank B! And thanks Derek for all the awesome tuts. When I opened the CrazyTipCalc.java in the code it said (twice) “R cannot be resolved to a variable” any suggestions? Eclipse sometimes likes to add an “import android.R” statement at the top of your files that use resources, especially when you ask Eclipse to sort or otherwise manage imports. This will cause your make to break. Look out for these erroneous import statements and delete them. My app crashes as soon as I press a button? What is the error in the logcat? hi derek, sorry for bothering you, i’m having some problem with the code, is the same you put here but i feel more confortable implementing the interfaces, i’m having a numberformat exception only when i start the app and try to fill the bill edittext, but when i fill the tip first nothing happens, the app works normally, thanks for your attention, please let me know if you need the code. because if the app is just booting shouldn’t it just get the default values from strings.xml? Yes you could definitely do it that way. That is more then likely the preferred way. Hi Derek, I saw your video and coded up the whole thing as you explained. Whenever i run it on my device(android 4.0.4), It says “Unfortunately, …Stopped Working”. I basically get AndroidRuntime. What should i do?? Let me know if you need my code. Hi Derek, need some help. I was designing an app that would collect data from user, store it somewhere online to allow access to this data to other users of the app. Since SQLite wont work in this case, can you suggest something?? Which is the main error I’m getting. It apparently fixed itself after I had entered text values for tipEditText and finalEditText. How peculiar, does it cause a zero error due to a null input? Awesome Tutorials, but I have a quick question about downloading the files from your site. When I do -> click on Import on Eclipse > Import from Existing Android Project > Finish, I get this Error “Invalid project Description” , Is there something I am doing wrong? How Do I run your downloaded code on my eclipse so I can run it on my droid? … I already asked this on youtube, not sure which you would see and respond to. To run on device when you click run configuration then click and change the target to your Android device which is plugged into the computer.
? Is there a specific reason for this? In my opinion you are keeping things double (no pun intended), and not using the MVC model properly. Thanks for the videos btw! Hi, I agree, but sometimes when I’m writing code I have to make a judgement call on whether writing unoptimized code sometimes makes it easier to understand what is going on. I always assume that advanced programmers such as yourself will spot the issue and optimize it, while true beginners will at least understand the basics of what I’m trying to teach. I hope that makes sense? yeah sure I understand now. I am only a beginning android developer so maybe there were some hidden tricks behind this i did not know of, that’s why i asked. Thanks for the reply. I want to build an offline android Dictionary English-Nepali app where there is a database of the words and its corresponding word in other. And, whenever the word is given for search it points out to the nearest match. Can you please explain on how can I build this. Is there any readymade libraries for this? Later on in my Android Video Tutorial, I show how to create a database and how to query it for information like translations. I also have a link to a SQLite tutorial on that page to help you. Tell me if you have any other questions. Thank you 🙂 i try to do my best. thank you very much,brilliant tutorial. Thank you very much 🙂 I’m glad you enjoyed it. This is so great! It was a long time when I did programming. I thought I will not do it again because there’s so many languages and so many versions, and I thought mobile App development is complicated… until, I saw your videos. It’s so informative and for sure I will watch all of it. THANKS A LOT! Thank you 🙂 I’m very happy that I could help. i’m gona continu to check every line but if you have an idea and a couple of minutes to spare by writing something about that. that will be helpful. Thanks anyway for your work, it’s awesome. Never mind, i was out of range declaring my methodes at the wrong place. Thanks anyway. The french guy who enjoy your tutorials..
shouldn’t the savedInsatanceState.getDouble(…) function be called in the onResume(…) function? because according to the Process Lifecycle when a background comes back to focus, onResume() in called. Yes I didn’t cover that because I didn’t want to add additional confusion about that at the time. That may have been a mistake in hindsight? Thanks again for your time and your good work. Thank you for pointing that out. I couldn’t figure out the problem for the longest time. I’ll put a note on the video. Great tutorials, I just finished this video and have the app built upto the seek bar. I tried adding an additional listener for the tip amount so that if the user directly edits the tip amount instead of using the seek bar the final bill will adjust accordingly, however the app crashes when I change the tip amount, it’s definitely the listener I added – If I comment out the listener I added it doesn’t crash. It works if I only change the ones/hundreths place but if I change the 10/10nths place it crashes. thank you very much for this turial Derek, I really learned a great deal. Theres just this one thing Im now sure about, in the method – updateTipAndFinalBill(). why did you have to declare the data type of the variables : tipAmount and finalBill. You already declared them as doubles at the beginning of the activity. Sorry about the confusion. I was referring to local variables in those later functions and I made a judgement call to give them the same names as the global variables. In hind sight that was a bad idea, but technically it is still ok.
Basically we need a unique name for our keys. Normally I would use a name like com.newthinktank.total.bill. I then would create a shortened variable name that would refer to this long key. That way I get a unique name, but it will also be short and easy to use. So any place I type totalBill, com.newthinktank.total.bill would actually be there. It is just the key part of the key / value pair. We need this so that we can pass this data between activities. Does that help? Hello Derek, I am therry pleased by your tutorials, everything is therry clear and you explain it all so good, that even a fool would understand. So If you will do this, you’ll probably get a VIP palace in heavan. Thank you 🙂 I’m sorry, but I don’t expect to cover xamarin anytime soon. I prefer to make tutorials using free tools so that everyone can participate. Sorry about that. Just curious, your function “onSaveInstanceState” whats its use? If I keep or remove this function from your tutorial I do not see any difference when I flip my phone or if I go to another program and return to this one… If I close the app the values are not saved with or without this function. It is used to save data when an Activity loses focus. You’ll see many better explanations for its use as I create more complex apps. Hey there, I’m really trying to figure this one out, checked my code against your code but I find my error nowhere.. Whenever I open the app on my phone, and I try to input something on the Bill amount the app crashes. If I try to put something in the Tip amount, then everything works correctly. But if I go to the bill amount from the beginning it just crashes… Can you spot the possible causes with this? I could copy paste part of the code if you’d like to see it, but I’m not sure if this will help. I see other people had my same error, somewhere I just probably didn’t read those well enough. I believe exception handlers and other things will be added… Thanks! Yes I didn’t focus on catching every possible error because I wanted to focus on the Android code specifically in the beginning. As the tutorial continues I spend a great deal of time covering exception handling and such. The most common reason for the crashes is the use of commas in the bill. I didn’t expect people would enter commas. Sorry about that. But i have a problem. When i change the tip amount. It doesnt edit the final bil. The final bil stays the same. And i cant use the seekbar cuze when i try to my app crashes. I saw your post above with the commas problem. So i copy all the files here above and the app stil didnt work any idea what the problem could be? I really liked the tutorial. One question on this blog as it appears in Chrome, though, is how do I select only the code without the line numbers in the samples? I think there’s a trick to using a table to do this, so that the line numbers would be a column by themselves. pastebin.com does it that way I think. But that’s a small irritation. Keep up the great tutorials. Thank you 🙂 I’m glad you like the tutorials. To copy the code without the line numbers, put your mouse on the code and in the upper right hand corner 3 icons will appear. Click on the first one named View Source and the code will appear without line numbers. The tutorials are incredibly easy to understand. I am very happy to have come across them when I did and I will no doubt watch the tutorials on OOD and Java Algorithms. Liked your fast paced tutorials covering many things in place. Is there a website or something where I can find a categorized list of these tutorials? Appreciate your reply to almost all the comments, so committed. I try to do my best. Some times I get a bit backed up though. Hey Derek, thanks so much for creating these. They are great! Quick question – is the data that you store in those 3 constants available once the application is closed, or only when it is paused? What would be the easiest way to permanently store data like this? I’m sure you’ve addressed this in later tutorials so feel free to direct me there. Thanks again! You’re very welcome 🙂 I normally store a small amount of information in a file. If I need a larger group of information then I tend to use SQLite. First of all “KUDOS” for this awesome series. I could have never thought that android programming would attract my fancy but thanks to your lectures! AWESOME! I built the same app but without the seek bar functionality. Now when I am trying to run my code while opening the app and trying to delete the ‘0.0’ value (which is by default) in the EditText field of the Bill through the inbuilt keyboard to give it a new value , the app crashes saying “CrazyTipCalc” app is not responding. I compared your code (minus the seek bar functionality) and it seems to be same. I answered your question on YouTube. Are you still having trouble with this? Nope ! Thanks…I made the Text Watcher inside the onCreate method itself so I think the problem was there. I took it outside the method and it worked. Hi, I felt like fiddling with it a little more than you demonstrated, and tried to figure out a way to update the final bill as you change the tip amount. I got as far as adding a change listener to the tip amount, but if you completely delete everything from the tip edit view (and leave not even a 0) it crashes. Thank you very much 🙂 I appreciate you taking the time to tell me that. You are the one who makes this really clear and simpler!!! Thank you very much 🙂 I do my best. So I followed the tutorial completely and eclipse reported no errors with any of the code. However, at the end when I attempted to run the app the emulator would crash instantly, every single time. I also made sure to leave hardware keyboard unchecked. What is the error you saw in LogCat in Eclipse? I provide all the code. You can also import the whole package. Try that out. It is probably a typo. Okay two things: First in the console log (which I’m assuming is LogCat) it says “Failed to allocate memory: 8”, it has a blank line, then it says “This application has requested Runtime to terminate in an unusual way.” Second I downloaded your whole package of crazytipcalc and I extracted it to my App_workspace folder (where eclipse has chosen as my project storing location) however I cannot figure out how to actually have it available to run in eclipse. I’m able to open up the .java file, but it won’t show up in my project explorer. I cover how to install the newest Android tools here. That should solve that problem. I have a tutorial on how to install the new Android tools. Have you seen it? Derek – i just started with Android – your tutorials are fantastic. Thanks and keep up the great work. Thank you very much 🙂 I’ll be making Android apps for most of the rest of the year. Hi Derek. Very good videos on android apps. Please teach us one app which needs a server as well like WhatsApp. Thank you 🙂 I’ll be covering how to set up a web service. I made a couple of tutorials on how to read from them. That will come out ASAP. hi sir would you like to upload some tutorial about GPS Development??????? I will cover GPS and everything else I missed after I finish with my App Inventor tutorial. I did a ton of things with GPS in my App inventor tutorial. Thank you 🙂 Why not get that translation app done quickly? If you use App Inventor and the Google Translate API you could get it done by parsing the json data. I cover app inventor in my Android Development for Beginners tutorial. Thank you for such a great android tutorial you have, i’m gonna go through all your android tutorial.. I use the latest ADT, and based on your ADT 26 tutorial. The key error is NullPointerException. This is triggered when an object has the value of null. Did you by any chance type a comma in the tip part. That causes an error that I wasn’t expecting. I am also seeing this error. It looks like the latest eclipse SDK is creating the Android App with fragments that breaks getting a handle to edit controls using findViewById() in onCreate() of the app. Fragments seem to make coding overly complicated. I’ll make a tutorial very soon that will explain what changed recently with Android. Best tutorials I’ve found online for Android Development. And heres the java I’m using to initialize the SeekBar. When I type the above code, the id changeTipSeekBar cannot be found. When I changed the id in the graphical layout, it asked me if I wanted to update all references and I said yes. I found that if I go in and initialize another string in strings.xml and then set that string equal to android:text=”@string/newString” in the seek bar xml then it fixes the error. Thank you 🙂 Sorry I couldn’t get to your problem quicker. I’m glad you found a fix and posted it. REALLY REALLY GOOD TUTORIAL SIMPLE AND GOOD THANK YOU.. Thank u soooooo much for ur tutorial! It really helps soooooo much!! I got a small problem that is hard to explain and I can’t understand it. So I know the key-value pair concept. For example String type TOTAL_BILL is the key of double type finalBill. So when u do “putDouble(TOTAL_BILL, finalBill);” the value which key is TOTAL_BILL will be replaced by finalBill, right? So my question is before u actually use this key-value pair, u must in somewhere pre-set the key-value pair in ur code. But I don’t see u did that. So how could Android know that ur TOTAL_BILL is associated with finalBill, not something else? Those association must be setup in Java code, but I can’t find where u did this. I really appeciate for any idea about my question. outState.putDouble(TOTAL_BILL, finalBill) stores the value in finalBill to the key value pair. I think I understand it. Thanks!! Go keep watching ur tutorial! You are very welcome 🙂 I’m happy if I can help. If that doesn’t get rid of it, Right click on the error and delete it. It probably won’t come back. To update an app you upload a new apk file but make sure you have incremented the android:versionCode and android:versionName attributes in the element of the manifest file. Thank you for your tutorials. They are great. lines my program works fine. Else, it doesn’t. I have typed in exactly the same code you have used. But still the listener part is not working. In the previous comments you have mentioned that we need to include exceptions for the program to work correctly. As i am a beginner i couldn’t solve this error. I went through your successive tutorials but you haven’t mentioned about the exceptions. Could you kindly help me out with this by either providing me codes or links to get this resolved. What errors are you getting? It may be an issue in the layout files? Great tutorials Derek. I usually dont write comments, but your tutorials are way too good! Thank you so much, I am glad i found your channel/website. I will be waiting for more of your videos! Thank you very much 🙂 I do my best to make the best tutorials that I can. i’m glad you like them. Thank you for the awsome tutorials. my main class always says extends ActionBarActivity while yours just says extends Activity. That is the only difference i found between mine and your code and once i changed it to yours it worked, and before the app would just crash. Do you know why? and how can i make it so it automatically just says extends Activity like yours. Thank you 🙂 If you set your minimum API in the manifest to 11 that will go away. First of all, thank you SO much for these tutorials. I’m a beginner and i wanna know that if i follow all your tutorials, do i need to read and learn more from developer.android.com?? or are your tutorials enough? And and i ran your code, without the seek bar. Exactly the same, infact i even copy pasted your code to check if i did a mistake, even then when i run the app, even if i try to remove the 0.0 from bill, the app crashes. Any idea why? Thank you so much again! I cover a lot while making one app after another in this tutorial series. My newest Android tutorial will finish up everything I missed here like interface design and such. What error do you see in the logcat panel for this app. The most common occurs if a comma is entered in the amount. I get the same exception. As soon as I edit the Bill EditText content, my app crashes. You get that error if you enter a comma instead of a decimal for a price. I really appreciate the android tutorials! Except for when using this one i keep having a problem with the seekbar. I always get a NumberFormatException error. He can’t parse 0,2 for example to a double. He can only do that for 0.2 and it seems that my seekbar outputs his data with “,” any ideas how to solve this? You can’t use commas in anyway for the tip amount. Sorry I didn’t expect people to use commas. Just want to ask on how to restore the R.java file? I’ve already encountered this 3 times and its frustrating to recreate everything again. Hope you could address this concern. Try running a clean on the project, or under the Project menu is an option build automatically.